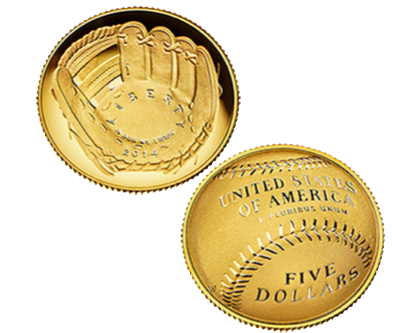 The US mint has none of the 50,000 curved commemorative $5 gold coins issued in recognition and celebration of the National Baseball Hall of Fame. The coins, the first curved currency ever minted, are 90% gold and weigh 8.359 grams each. The part that curves inwards — heads — displays, of course, a baseball mitt. The round side, or tails: A baseball. The Mint still has silver $1 coins and clad half-dollar version of the coin for sale. Prices include surcharges of $35 for each gold coin, $10 for each silver coin, and $5 for each half-dollar, which will be paid to the National Baseball Hall of Fame to help fund its operations.